(Phys.org)—A small team of researchers from Fordham University and Providence College, both in the U.S., has found that there are small but discernible genetic differences between rats living uptown versus downtown on the island of Manhattan. In their paper published in the journal Molecular Ecology, the group describes trapping rats from one end of the island to the other, conducting genetic tests on them and outlining what they found. New York City, like other major cities in the world, hosts a very large population of rats—in this case, mostly brown rats. Most people that live there find them to be a problem, because in addition to being destructive and carriers of disease, they are also considered to be disgusting. In this new effort, the researchers sought to learn more about the rats that live only on Manhattan Island, noting that little work has been done to understand the rats that live there. The study consisted of trapping rats, moving north to south on the island, cutting off their tails, and using them as a source for DNA analysis—and then comparing the genomic results by geography. 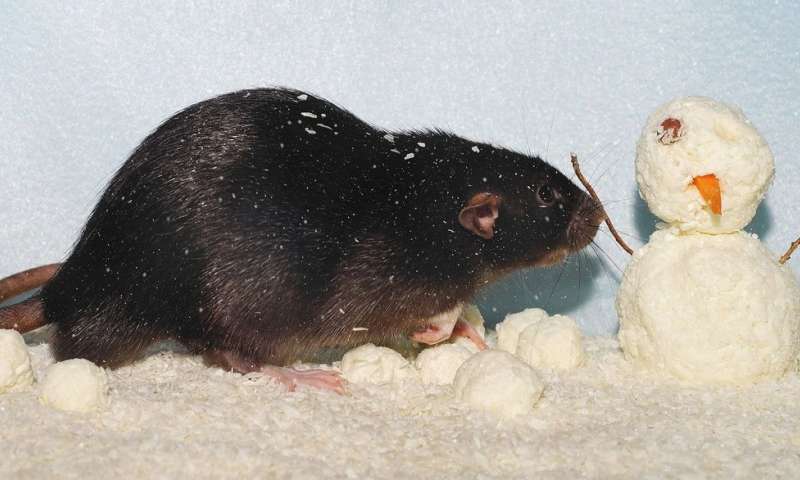 The researchers report that the vast majority of the rats were descendants of rats from western Europe—brought over on ships over 200 years ago. But the analysis also revealed that the rats have been in the area long enough to have developed minor genetic differences depending on where they lived. This, the team notes, was not particularly surprising due to rat behavior—they rarely stray far from home. Nor was it surprising to see differences between the uptown and downtown rats—the two areas are separated by the commercial district, which is not particularly favorable to rats. Thus, those that live uptown have little incentive to move downtown, or vice-versa. Surprisingly, the analysis showed that there were even slight differences between neighborhoods—each had their own distinct rats. The researchers could tell, for example, by looking at an individual rat profile, if it had resided in the East or West Village. The group plans to continue their study of urban rat populations, looking for patterns that might help city planners reduce the number of rats, making cities safer and less disgusting places to live. Human commensal species such as rodent pests are often widely distributed across cities and threaten both infrastructure and public health. Spatially-explicit population genomic methods provide insights into movements for cryptic pests that drive evolutionary connectivity across multiple spatial scales. We examined spatial patterns of neutral genome-wide variation in brown rats (Rattus norvegicus) across Manhattan, New York City (NYC) using 262 samples and 61,401 SNPs to understand: 1) relatedness among nearby individuals and the extent of spatial genetic structure in a discrete urban landscape; 2) the geographic origin of NYC rats, using a large, previously-published dataset of global rat genotypes; and 3) heterogeneity in gene flow across the city, particularly deviations from isolation-by-distance. We found that rats separated by ≤200m exhibit strong spatial autocorrelation (r = 0.3, p = 0.001) and the effects of localized genetic drift extend to a range of 1400m. Across Manhattan, rats exhibited a homogeneous population origin from rats that likely invaded from Great Britain. While traditional approaches identified a single evolutionary cluster with clinal structure across Manhattan, recently-developed methods (e.g., fineSTRUCTURE, sPCA, EEMS) provided evidence of reduced dispersal across the island's less residential Midtown region resulting in fine-scale genetic structuring (FST = 0.01) and two evolutionary clusters (Uptown and Downtown Manhattan). Thus, while some urban populations of human commensals may appear to be continuously distributed, landscape heterogeneity within cities can drive differences in habitat quality and dispersal, with implications for the spatial distribution of genomic variation, population management, and the study of widely distributed pests.